It has been a little over two months since we debuted the 2019 draft rankings on McKeen’s. Much hockey has been played since that time and our views on the 2019 draft class have naturally been refined as well. Most notably, while we were only comfortable ranking a first round of talent last time, with the increased information, we have also doubled our ranking to now show two rounds worth of players, lined up in the order of their expected future value, roughly through age 26. In addition to the 62 named we have ranked here, we have thrown in 38 more as unranked “Honorable Mention” players as others whose chances we like of hearing their names called in Vancouver in June. So with a little over half of the hockey season behind us, what can we say about the Class of 2019? 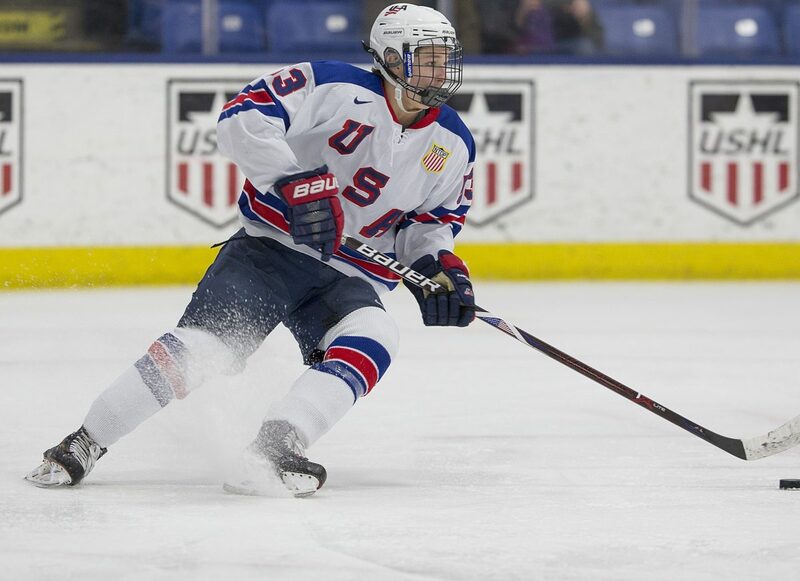 We have a top tier of three forwards, all of whom shone to some extent at the recent WJC. 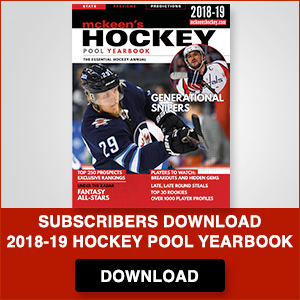 It is hard at this stage to see any other players bumping any of Jack Hughes, Kaapo Kakko, or Vasili Podkolzin from the top three, even knowing that Podkolzin is reportedly unlikely to leave Russia in the next few years. None of these three project to reach the heights of recent top-of-class talents such as McDavid, Matthews, Laine, or Eichel, but all stack up nicely with most recent class leaders. After that very top, the draft class is heavy with WHL and USNTDP talent. We have four WHLers ranked in the top ten including the four through six slots (Dylan Cozens, Kirby Dach, Bowen Byram), with Peyton Krebs figuring in at #8. Three more WHLers are ranked in the first round while Alex Newhook (#15) from Victoria of the BCHL gives scouts yet another reason to spend ample time along the West Coast. Trevor Zegras. Photo by Rena Laverty. Looking at the USNTDP, after top man Hughes, we have seven others ranked in the first round alone, including a run of four in a row between 10 – 13, of Trevor Zegras, Matthew Boldy, Cam York, and Alex Turcotte. The U18 team this year is likely better than any other in recent memory and Jack Hughes is merely one of many standouts. In fact, as this article is written, Hughes is on the sidelines on a day-to-day basis with a nebulous lower body injury. No matter, as his teammates took down Central Illinois by an 11-3 score and then defeated top USHL team Muskegon 4-1 the next day. Before we come to our final ranking, there will be other USNTDP players considered for the first round who we do not have ranked there now, but regardless of the names, it would not surprise in the least to see between 7-10 from the program go on the first day of the draft. And just like the WHL also calls for an honorable mention with Newhook of the BCHL, as the USNTDP plays most of its games in the USHL, scouts have a few other high profile targets to view there in Chicago’s Robert Mastrosimone (#31) and Sioux City’s Bobby Brink (#34) once the latter returns from an injury sustained at the WJAC in December. Beyond the inevitable shuffling that goes on in draft lists from month to month, we have added in six names who were not in the top 31 at the first look, all in the back third of the first round. From the OHL, we believe that the scouting reports back up the statistical profiles of London’s Connor McMichael (#22) and Niagara’s Philip Tomasino (#23). Overager Brett Leason (#24) from the WHL’s leading Prince Albert squad is making a great case to join the likes of Tanner Pearson and Henrik Borgstrom as recent second/third year eligibles to have made such leaps in their game as to be first rounders. Finnish blueliner Ville Heinola (#25) had a strong performance at the WJC on route to a Gold Medal for Finland, improving his stock considerably. Another strong WJC performance helped German defender Moritz Seider sneak on near the back of our first round, although in his case, he played in Division 1A of the WJC tournament, captaining Germany to a championship and a return to the top tier of international U20 hockey. Finally, our last newcomer to the first round, as we hinted could be the case last time, is a rare elite netminder, in Spencer Knight (#26), naturally from the USNTDP. While Knight was at the recent WJC, he was the third string netminder for the silver medalist Americans and did not suit up for a game. He is simply a prototype of the modern big, athletic netminder and he keeps the puck out of the net. We could attribute his placement towards the end of the first round on the failure of more skaters to assert themselves as first round talents, and there is some truth to that as there is a relatively sharp decline in talent after around the 21st player on the list below. But that isn’t all. Knight has no red flags on his scouting report outside of his position. The average first round is a hair over 6-0”, 180 pounds, with none taller than Brett Leason at 6-4”. The top of the class is also very heavy in forwards, with 22 ranked in the top 31 and another 17 in the second round. With all of this said, I am reminded of what an old scout once told me about how draft classes are made off of what happens after Christmas. That time has only really just begun and there are still three months of regular season play for these young men to complete filling out their resumes for the draft. We fully anticipate that more players will make “The Leap” in the next while and for there to be pop-up players who we may be dismissive of now but for whom by April we will swear MUST be taken on day one. There will be others whose current upward trajectories will stall out and find themselves falling down draft boards. There is a lot of hockey still to be played. The list that follows is our snapshot of where things stand today. Enjoy.